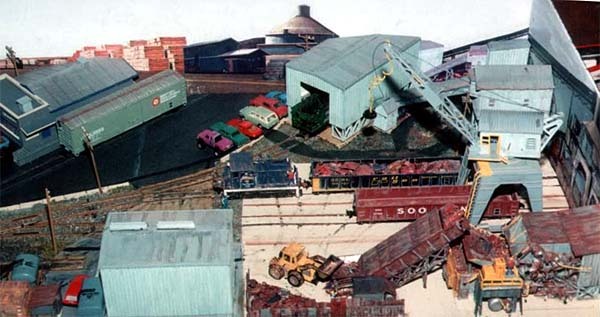 Harrterm Yard is Ian Bareham’s small HO switching layout, featuring lots of detailed industrial scenes. The L-shaped shelf design uses modern North American equipment, and is scenicked to represent the Pacific Northwest, near Vancouver. Photos by Ian Bareham. 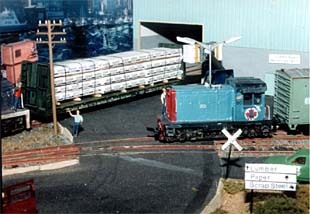 Carl Hille, who hails from Sequim, WA — not far from the setting for Harrterm Yard above — was hard pressed to find room for an HO layout. He had some nice trains depicting the Alaska RR, where he used to live, but couldn’t find a place to display them. So he converted some window sills to long, slender layout spaces. An under-construction result is shown above, as the 5:14 mixed freight pulls into Seward to the applause of the tourists and locals alike! Photo by Helen Hille. Todd Gamble custom-built this Z-scale railroad to fit on a client’s television set and show off a collection of miniature cottages. It’s wired to light up at night (below). By day, Todd creates art for role-playing games in Washington state. You might also enjoy making some of his paper fold-up buildings, available online. 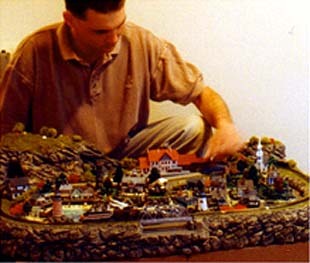 UPDATE– Todd has just forwarded (Feb. 2003) a couple of stunning closeup shots of this little Z scale table topper, so we’ve added them to the story. What an amazing amount of detail he’s packed into this tiny space! And finally, not from the Pacific Northwest but from England’s talented Giles Barnabe comes this design for a mythical British narrow gauge line. 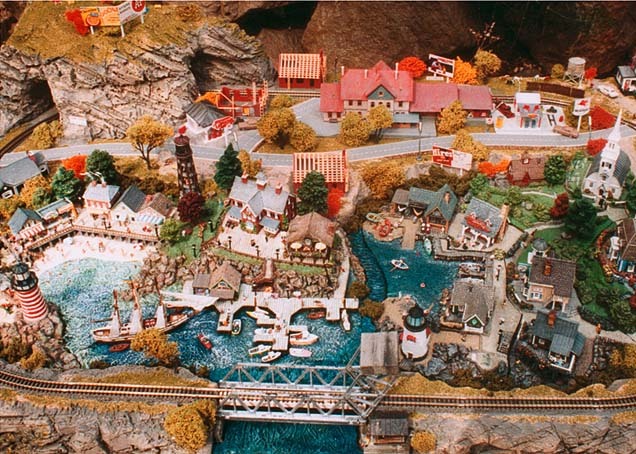 Scenery to show off the trains is emphasized here, with limited operation in a 20″x30″ (50×76 cm) space. This trackplan was developed from another layout, built into a suitcase, which appeared in the British model press in the late 1960’s. Giles describes the layout like this: “The basic oval is partly hidden by a stony hillside into which the main line delves, and there is a branch line running uphill into a mine situated across the river from a passing station. 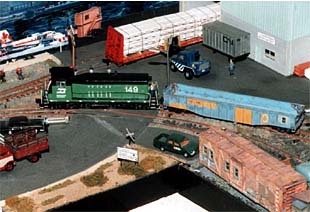 There is just room for a siding off the oval inside the hill, which allows one train to be stored while another takes its turn around the main line. There’s also the possibility of adding locomotive sidings in the two hidden corners.